I'm happy to report that this was an excellent choice for reading, and it was also excellent good fortune that I had it in my purse when I was whisked off to the hospital, otherwise I would have been bored to tears before fishy was able to come home and pick reading material up for me (which, to his credit, he did; the latest Garden Making magazine, another gardening magazine, the Kobo and Wilkie Collins all came along after I was safely ensconced in bed). It was also exactly what I have come to expect from McKillip: a gentle, beautiful story of wild, unpredictable and beautiful magic, and the people that magic touches, tinged with a sweet melancholy. I think, overall, this is a better book than The Bell at Sealey Head, her last release, which I quite enjoyed but seemed a little... forgettable? Good excuse to read it again, I guess. 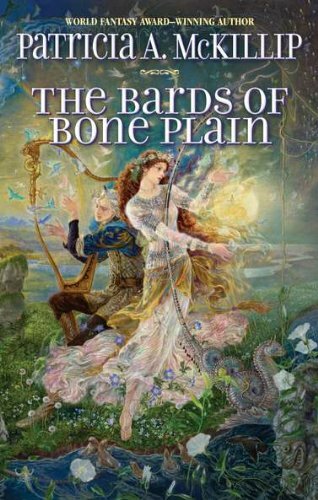 But The Bards of Bone Plain is a solid story, interestingly and carefully told. The plot is twofold: the first plot involves three characters revolving around each other. Zoe and Phelan are senior students at the bardic school; Beatrice is the youngest daughter of the king, and an aspiring archaeologist working with Phelan's mercurial father Jonah. There isn't a lot more to this plot than watching Phelan unravel the mystery of his father, really, and the answer comes to us much faster than it comes to Phelan; if there is a flaw with this book that I can point to easily, it would be that. I knew what Phelan didn't in the first few chapters, and I'm not sure whether or not it took away an element of ... curiosity, maybe, that might have made for more engaged reading. That said, as with my favourite McKillips, it's not the end itself that makes this story worth reading; it's the journey. The second plot revolves around another bard, the legendary (in Phelan's day) Nairn. We see his story through snippets of historical documents, ballads and poems, and then we read the true story, what really happened, in chapters that alternate with the first plot's chapters. It's an interesting, if not original, exercise in recognizing that real human beings lie behind legends. And then, of course, the two plots cross in a surprisingly tense confrontation at the end -- surprisingly, I think, because there's not really a true villain, and the stakes are only really high for a few of the characters, not for the fate of many or the world. And yet I was invested in what happened. What can I say? I loved this book in the same way I've loved everything else I've read by McKillip over the years (Forgotten Beasts of Eld and Song for the Basilisk notwithstanding; I liked them both well enough, but didn't get sucked into their world in the same way. I'll be trying Song again, though, because I think that was more a mood thing than a book thing.) It had some familiar elements; I hesitate to say it, because the characters were interesting as individuals, but some of them might be viewed as extremely similar other characters she's written... but I like that in her work, for some reason, where it might really irritate me in another author's. And the world was a new one for her: elements of historical medieval-type fantasy, with elements of technology slipped in. The princess drives a car, a relatively new technology to her world, and there are steam-powered trams, and gaslights. This book is also about change, and history, and the progression of society over years. It's a little light on the examination of that, but it's a theme slipped in nonetheless. And the writing. The writing, of course, is the key to my love of McKillips' work. It is beautiful, lyrical, leaving enough unexplained to give the whole story a hint of mystery and wonder, but detailed enough to paint the whole scene vividly in my mind. As a slight aside, I should mention that I think the marriage of McKillip's novels with Kinuko Craft's cover images is sheer brilliance; they compliment each other perfectly, and both the writing and the cover images give me the same gleeful, floaty, fairy-tale feeling. I of course recommend this book to fans of McKillip; I'm not sure it's the best place to start with her writing if you haven't read anything by her before (I'd suggest Riddle-Master or The Changeling Sea for that) but it's a lovely gentle fantasy tale about a father and a son, and magic and the past, worth reading and worth reading again. Glad you enjoyed this! I haven't read any McKillip for a while, but I do love her books. I'll add this one to my list. Hope you are feeling okay! Aside from tired to the point of stupid, I'm feeling pretty good. We're all doing really well, especially now that we have a bit of a routine going. Plus, I think I'm reading more now than I have in a long, long time! re: McKillip -- it's so nice when the latest book by an excellent author meets expectations. I'm always relieved.